A certificate to send to your insurance company. The certificate is a Guild Pro valuation and its stored on the intrinsically secure e-register, and a Licensee number through which, in the case of a claim, your insurers can immediately establish the item and make a payment to you without too much fuss. Without this, you would have to prove the item belonged to you; show a picture of you wearing it; its purchase receipt. Who wants all that hassle, that’s avoided for a small fee to an assessor? Also, it could possibly reduce your insurance premiums, another plus in its favour. Finger rings, especially engagement and wedding rings, which are usually worn 24 hours a day, every day, have to deal with an immense amount of activity. Shower gels, hand soap, washing-up liquids, hand creams and various other household chemicals all create a build up of grease and grime in the crevices of your rings. They can also cause a rash on the skin between finger and ring. If your rings are a loose fit, please ensure you remove them before washing up or even swimming. Fingers seem to shrink when immersed in water for any length of time and that spells danger for your jewellery; rings are lost down plug holes before you realise it. Put them somewhere safe, not on the rim of a basin where they are accidentally knocked off. There are products available which you can use to make your rings fit better, such as a clasp fitted to the inner rim of your ring or a gel solution which will create a non-slip coating, again on the inner rim of your ring. Soaking them in a mild solution of warm water and a gentle soap. Use a soft brush such as an old, but clean, make up brush or soft bristled toothbrush. Using a toothpick for the really stubborn areas, taking care not to scratch the stone. Using an ultrasonic cleaner – not really recommended unless you are sure of the type of stone as not all stones are suitable for this treatment. Opaque gemstones such as Lapis Lazuli, need special care. Just wipe clean with a moist cloth; they are porous and absorb chemicals more easily because they are, essentially, rocks not minerals. Pearls and Amber can also be damaged by hairspray and perfume. Pearls retain their lustre by being worn. Don’t just throw your jewellery into a drawer. The gem stones can scratch the metal of your other jewellery. 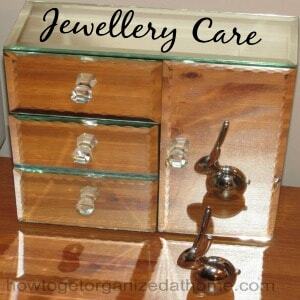 Invest in a jewellery box or keep them in the boxes which they came in when you bought them. Talk to your jeweller for advice if you are unsure what to do. They will often clean them for you, too.